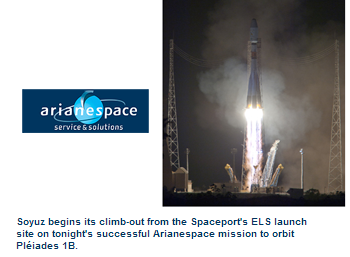 Arianespace successfully launched the Pléiades 1B observation satellite for the French space agency aboard a Soyuz rocket from the Guiana Space Center (CSG) in French Guiana. Pléiades 1B is a very-high-resolution dual-use military and civilian satellite designed to provide optical imaging . The 1-ton class satellite was built by Astrium at its plant in Toulouse. Thales Alenia Space supplied the very-high-resolution imaging instruments and the image telemetry system. This launch marks the ninth mission for Arianespace from the Guiana Space Center to date in 2012, including six Ariane 5, two Soyuz and one Vega launch. The company's European-Russian subsidiary, Starsem, has also carried out a Soyuz launch from the Baikonur Cosmodrome in Kazakhstan. Arianespace has scheduled another Ariane 5 launch by the end of the year.